The problem: how to be the first listing, because being the 40th listing is fairly worthless. The answer: You probably won't be. There are 14 million matches for Plumber, and no, you won't be #1 or #2. You lost. In fact, in just about every keyword worth owning, your chances are winning are small. None of those require luck. Just patience, effort, and investment. It looks like some of the local players have a good chance at ranking if they believe the relevancy algorithms to be more than luck, particularly if they read this document and local search blogs like this one. There is little point in trying to rank for a big money keyword right out of the gate. Smart SEOs generally insist on ensuring you use relevant keyword modifiers and alternative word forms. Why? Longtail keywords have less competition, are easier to rank for, rank quicker, and are more likely to convert (since they are more targeted). 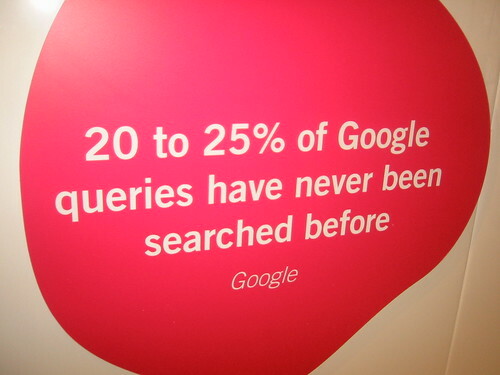 Google claims that from 20% to 25% of search queries are unique. Some of our pages rank for hundreds of unique keyword phrases because we employed in-depth keyword research, appealing page titles, and strong on page optimization strategies. 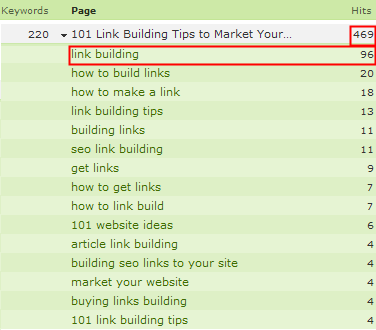 Even when we rank #1 for link building, that page still gets way more traffic for related longtail keywords. Once you begin to profit from the long tail keywords then you can reinvest in going after some of the more competitive and broader related keywords. And you can use your AdWords data, search analytics data, and organic ranking data to help you figure out what keywords to focus on next. When I have a great idea do I try to turn it into a home run? Yes. But it is doing all the other things that makes the occasional home run so powerful. A strong foundation increases the value of everything you do. Creating content that is well optimized not only helps you rank for a wide array of relevant keywords, but it also makes your content easier to find down the road. Generally I am a big fan of Seth, and I cite him often. I am a rather sophisticated searcher, but sometimes it can take me 15 minutes to find one of his posts because Seth is so dismissive of some SEO best practices...which is a bit unfortunate for the thousands of people who are not finding his blog ranked as well as it could, and are instead landing on inferior content that was published using better SEO strategies. It perplexes me how Seth can be so forward thinking and brilliant with so many marketing concepts, and then not really see SEO as a viable channel. If your SEO strategy is reliant on some misconceived notion of the natural order then you are losing money. Hope is not a business strategy. Neither is content without promotion, particularly in markets saturated with similar competing products. And that is why SEO is important. From a logical position Godin's argument is flawed. Godin tries to create a straw person--in addition to using a false dilemma. In other words, its pretty hollow even if he proves his point. Certainly not his best rant or manifesto. Shoemoney's strategy is based on one check, business smart, and being little cooky (read: internet media saavy). But, his strategy is just as one in a million as the one Godin tries to refute. Plus....shoemoney's strategy is built on the exact SEO Seth is decrying. Its a tad internally contradictory. That and he seemed to totally overlook 1) long tail 2) local search. Fundamentals of being digital in a Google ruled world. I've found that many people fall into one of two groups when it comes to SEO. 1. Those who dismiss it as something that doesn't work or doesn't have value. Both groups fail to achieve the results they could. The first group may have a powerful brand and solid business fundamentals, but miss out on a ton of traffic that they could be earning. The second group takes a stab at a few "tricks" or hires a snake oil salesman type SEO company that over promises and under delivers, and then gives up before they see any results. If more people would build a foundation based on solid business fundamentals, stick to achieving their goals over time, and add value, they would be far more successful. I wonder if Seth's position on SEO is somehow tainted by the SEO flop that was/is Squidoo? It was the Mahalo of it's day until spammers saw that it had potential, then Google slapped it, never to return to it's former ranking grace. Has Seth's SEO position remained constant from the beginning, or did it change after Squidoo became a has-been? Squidoo still ranks for a lot of valuable keywords, which sorta makes the lack of belief in long tail keywords confusing. Aaron, thanks for mentioning my Local Search Ranking Factors project. I obviously agree with all of your suggestions about geo-targeting keywords, with one small variation. Google's recent introduction of geo-targeted results to untargeted KW's (like "plumber") has opened the possibility for a local business to hit the home run via short tail phrases right off the bat by optimizing their Google LBC listing. But you're dead on: the organic traffic on long tail phrases for my clients occupies an absolutely huge percentage of overall traffic even with powerful short-tail 10-pack rankings. I agree about the local search showing up for short tail search queries presenting a huge opportunity...I was trying to point to that, but maybe I was not clear enough, eh? We all know we are in this for the long haul and only dedication will bear the fruit of our efforts, yet simple strategy such as the long tail goes widely unnoticed to those entering the ring for the first time. We all have varying degrees of knowledge when it comes to SEO what works what does not, then it can all be flipped on it`s head in an instant, which makes this industry so interesting to me. After years and years, i still find myself learning, i love this stuff and Aaron makes sense, again. I agree that the Shoemoney example was always a losing argument. It would be great to invent "Kersplutoo", build a fabulous brand with a great offer THEN rank for that brand. But how to get there? Well, one way would be to use the cheapest marketing channel that can reach eyeballs that have no idea you exist. As dcmusicfusion says, isn't this how Shoemoney got there in the first place? I think the underlying point that Godin made was valid. The article leaves that point to fend for itself amid dodgy explanations that leave the whole piece open to question. Thanks Aaron, for the careful reading and thoughtful comments. I want to clarify if I can. I think that very few people who consider SEO (or even sell it) are doing the careful, rational hyperlocal long tail seo you're talking about. Google is certainly making this easier (the plumber example is quite recent) but it's still very rare and hard for most people to aspire to. A. There are plenty of plumbers in Alameda who will not show up on this list. This is simple math. The Yellow Pages is brilliant because it permits money to be the arbitrator and because it brings a level of certainty to the investment. The plubmer gets neither of these from this sort of SEO. B. Almost all businesses need more than hyperlocal in the long tail. That's because (people like you and me and accountants and people who sell pottery) do business outside their zip code. So there is in fact a long tail here, but the problem is that very few people search properly. If you want to win the long tail search for "lead free pottery japanese teapots" I would bet you could, but that's not what most searchers type in, and not what most clients aspire to. So, I go back to the last part of my post. Far better to win at what you can control (and that's what business tends to be about) and then invest in long tail SEO on top of that. I think we can agree that for a small or mid-sized business to put all their eggs in the long tail seo basket is pretty scary. Absolutely Seth...I think any and every business needs a strong core to build from (most legitimate businesses do have brand queries high up in their keyword referral list) but the strong piece of fleshing out the longtail SEO queries is that the incremental cost can be quite low, and some pages can earn for years and years with little incremental effort. I think you have advocated as much almost exactly 1 year ago. And I agree that very few people are doing SEO well...which is part of the reason it is so powerful if one does do a good job at it. "I think we can agree that for a small or mid-sized business to put all their eggs in the long tail seo basket is pretty scary." I'd rarely advise SMB's to put ALL their eggs in the long-tail SEO basket, but just as ONE example, I have a client in a high-cost but high-ROI niche who has trimmed Yellow Pages spending from nearly $1MM/year five years ago to about $150K this year. Their ROI on "long tail SEO" is about 20:1. Their ROI on YP spending even at these dramatically decreased levels is only 3:1. An informed SEO analysis is always critical for any business to be successful online, but there are PLENTY of reputable SEO providers doing EXACTLY "the careful, rational hyperlocal long tail seo [Aaron is] talking about." It can be amazingly effective in a number of markets; it's true that the kind of Local Search that Aaron highlights in this article is going to get more competitive but the results are actually going to be far more lucrative than they've been up to now. I am going to have to agree with David on this one. many of my small business clients cant afford to rank for generics and as a result we target long tail traffic - it normally converts better as the consumer is probably closer to the buying cycle. On a separate note, more and more users are getting better at longer tailed searches to find what they want, which makes the longer tail much more attractive. "I think we can agree that for a small or mid-sized business to put all their eggs in the SEO basket is pretty scary". Its scary to rely heavily on any 1 channel (yellow pages, paid search, organic search, media buys, television, business partnerships, etc.). But using many in conjunction lowers your overall risk profile. If you do search well and have a legitimate site it can be a fairly high margin and low risk strategy. Yeah, that's what I meant, Aaron (the word long-tail SEO could be replaced by just "SEO" or by "any one channel"). I and others operate some smbs and among other things I do the webwork. We have 2 homeruns. We have a couple of sites that aren't homeruns. The homerun sites fortunately dominate most places (in one case w/ strong rankings in SE's for generic industry phrases (sort of like plumber). BTW; we have operated these businesses for yrs/way before web days. Everything counts. It does need to be cost effective though. The homerunniest of the homerun sites gets traffic and conversions from the 1 and 2 word kywrd phrases. It gets traffic from strong maps visibility. When we lost maps strength and local regional visibility on one phrase...we got killed on that phrase. Where we dominate maps we kill on that phrase. We get tons of varied long tail traffic. It drives a total of more traffic than the #1 and #2 killer industry phrases...by a long shot. It converts. (so many visits to the site and so many conversions that are wierd variations and come in 1's and 2's....but they add up. When speaking w/a friend and colleague in local seo--he told me I'd be a pain in the arse client--I want too much. I can see that. I used to sell services to clients. On the other hand, as the biz operator I want every bit of traffic I can get...so long as getting it is cost effective. Its harder to hit the home run today...without a doubt. On the other hand there are tons of plentiful singles and doubles in the long tail and it is far easier. BTW: @dmihm...thanks for twittering me over to this conversation. Besides that, I agree with Seth's point that most people want short-tail rankings. Because they want volume. Otherwise, why would most spending go to Google and not MSN (platforms aside, not to mention MSN's tools are rapidly improving + differentiating)? People use Google so they get 10K clicks/day, not 100 clicks/day. Even when we rank #1 for link building, that only drives 20% of the search traffic to that page. We have sites that simply can not compete for most competitive head keywords and yet those sites manage to make many multiples of what the average family makes (and that's on a per site basis). For the most part, the "home run" short-tail keyword for local small biz websites is the city name - service type keyword, like Oakland Plumber. I would not classify that as a long tail term at all, in relation to a local business providing that service. The broader term search, without the local qualifier, is now becoming the home run too with that local-10-pack now showing for those broad terms, but since Maps SEO is a different process from traditional Organic SEO the small biz still does not even have to try to go after "plumber" in the sense Seth was mentioning. They can indeed compete at the level needed to be seen in the local-10-pack. There is a fine budding community of Local SEO peeps who do indeed take the time to methodically optimize for the full range of relevant local keywords. You can see them commenting regularly on Mike Blumenthal's blog and some specialists in that field, self included, are listed on David Mihm's GetListed.org project. As I've said before, the long tail in local is very long indeed. This thread has both interesting commentary and a bit of controversy. Congrats. I went back and reread Seth's post. It's about branding. Its a great idea. I can vouch...it does work. As a small business operator with some experience and some winners and non-winners (yet) I'd like to speak to the experience of the biggest web winner. Frankly we try and strive to replicate that. 1. We have a "sort ova homerun" on one site. It has had high SE rankings for years for the industry equivalent of "plumber". Luck, work, a helluva good url chosen years ago...more work, more work..etc. got us to a strong position. But being ranked first organically for all "plumbers" (pre maps days--and certainly premaps--wherein google inserts a map for "plumber(s) for you Alameda folks) didn't necessarily get you all the plumbing traffic in Alameda. In fact if some more clever owner/webmaster/business had developed a site optimizing for Alameda plumber--plumbing repairs or something along those lines...that smart cat might well be beating our pants off for local Alameda plumbing traffic. Meanwhile we were getting plumbing searches from Japan, NYC, Puerto Rico....you name it. 2. Its very important to optimize organically for all the long tail industry phrases that might work for your business. Do it both with a wide variety of variations on industry terms...and do it w/ a wide variety of geo related terms...because if you aren't a local pizza place...as Seth referenced....you are trying to get business from folks in other zip codes, towns, counties etc. Years ago, Jake Baillie (JakedBake) who at the time ran TrueLocal, and probably was the one guy who both saw myriads of local searches and more importantly would speak about it publicly articulated this at an SEO gathering. Fortunately for us we had figured that out and were reaping its benefits. Ya know what? It still works in this world of maps inserts into organic search. 3. Maps is so damn important now its rediculous. Its both a boon to sites that optimize for it and an equalizer to sites that are organically optimized. In any case one really has to optimize for terms specifically for maps. It is different than optimizing for organic search (there is some overlap). If one wants to get a fix on that go to David Mihm's publication referenced above and Mike Blumenthals blog and piece on optimzizing for Maps. I had the honor of participating in both. Great insights and writing. 4. Branding (or the White Page approach). We get this also. I'm somewhat astonished at the volume of traffic we get for branding (either precise or variations on the specific branding). Its a lot. In our case its an offshoot of lots of work, tremendous name recognition, getting good word of mouth in the public, and a title that is the "brand". Heheh....we even have a little one-map second listing in google organic for that brand which references the G Maps listing. (and the brand name is used elsewhere. All the things above all contribute to traffic. They can come from all sources. Currently the long tail generates the most traffic for us. Since Google started injecting maps into non-geo oriented phrases that are primarily local/regional in nature (like plumbers) (they started doing this as early as late January on a limited basis) that has been a boon. There is some overlap between organic oriented traffic and Maps inserted into organic search but (we at least) more independent traffic from the long tail. With new businesses, I'd focus on both organic long tail and maps--pretty much equally. I doubt I could replicate the home run for something like plumbers though. One last funny thought about all this. I still answer the phones at our business. I believe the research suggests that local buyers tend to research on line and then email/fill out forms at about 40-50% and call the business at about 50-60%. Anyways this guy calls and I answered the phone w/ our "branded name"....blah, blah blah...can I help you. He responded with something like...."are you the (non branded name/a variation name...of our suburban community? I said "yeah yeah...that is us". He repeated the non-branded name...but our town name. I responded "yeah yeah...that is us". The phone injection of the "branded name" through him off. Finally we started speaking. I remember reading a long while ago that Seth, along with a few others, didn't do any SEO on his blog. And his blog address is sethgodin.typepad.com - according to everything you can read elsewhere, this is bad practice: he should've owned the domain. And there are few visuals - this also goes against the grain of "truth" professed by many bloggers. But he still IS Seth Godin, regardless of how successful some of his ventures are (arguably, one cannot be successful at everything). So what that people don't find the relevant posts on his blog on Google? They should have Seth's blog in their RSS readers anyway... :-) I guess this may simply be his way of saying that it doesn't matter what you do to optimise the results, branding and the quality of product/service is what's going to keep you running. branding and the quality of product/service is what's going to keep you running. And yes to many hyped up scammy get rich quick schemes outsell some businesses that are pure as snow and deliver 100x the value. At the end of the day EVERYTHING comes down to profit margins. If you ignore targeted distribution channels in principal then you stand a better chance of losing overall. Thats the problem with most successful, large-audience marketers. They find something that works for themselves, but doesn't realize it works for everyone else, especially those that are not a national brand themselves. Seth: How many one-man show plumbers do you know by their brand name? Thats right: NONE. Seth fails again. Oh, and he will continue to fail as long as he rejects his customers by not allowing comments on his blog.